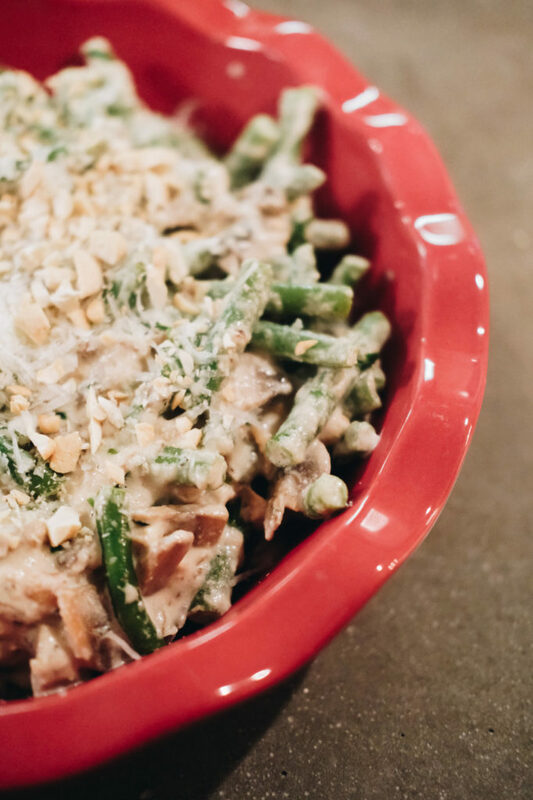 This dish is my nutrient dense, flavorful and wholesome answer to traditional green bean casserole. Out with the canned cream of mushroom soup and fried onion ring topping. No thank you! 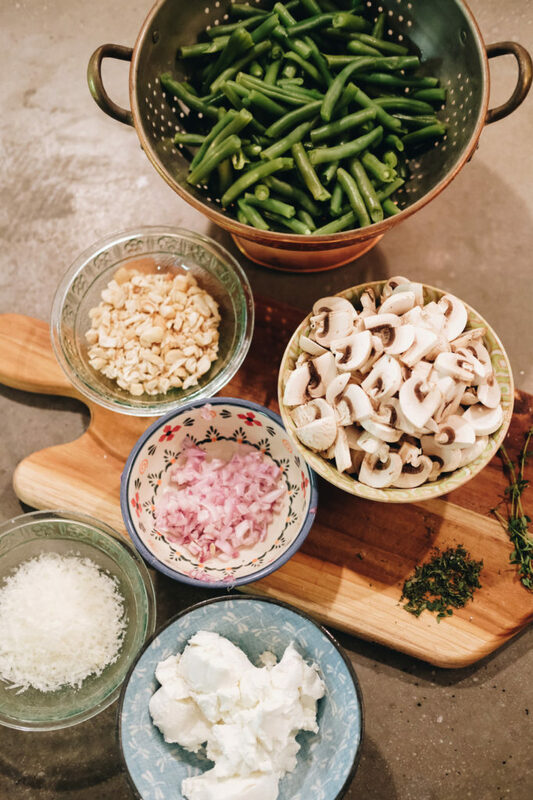 Give me all the goat cheese, roasted cashews and fresh herbs and mushrooms. Yum! This dish is so rich in flavor I guarantee you will not miss the old recipe one bit. I am really excited to make this! Don’t be afraid to add your own spin on traditional dishes! Especially any tweaks that add nutrition, flavor and freshness. 1. 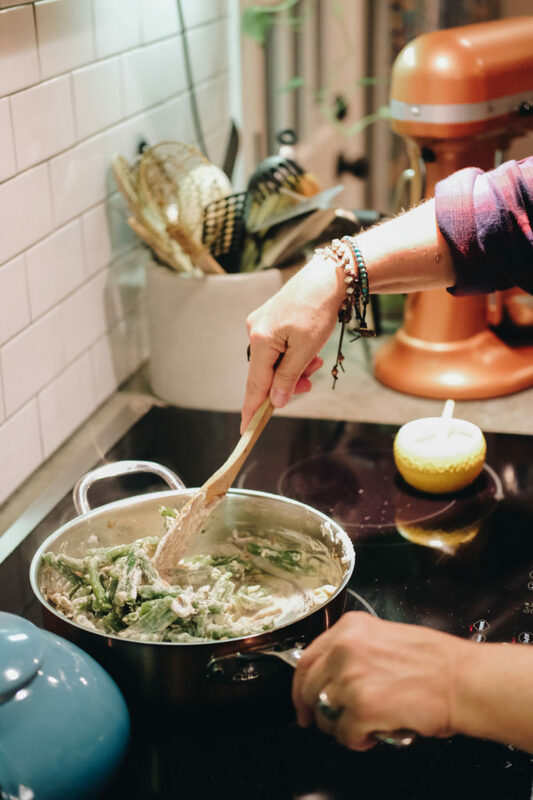 In a medium-size saucepan, cover green beans in salted water. Boil until green beans are just done, (still have a snap to them). 2. In a large skillet over medium heat, melt the butter and saute shallots until translucent. Add mushrooms and saute until mushrooms are browned. 3. Deglaze pan with sherry and let simmer for about 1 minute. 4. Lower heat to medium-low and stir in goat cheese until melted. Add thyme, half of the parmesan cheese, salt and pepper. 5. Stir in green beans until evenly coated. 6. Sprinkle with nuts and the other half of the parmesan cheese. 7. Pour into a small casserole dish and put in the oven at 350 degrees for 25 minutes or until brown and bubbly. 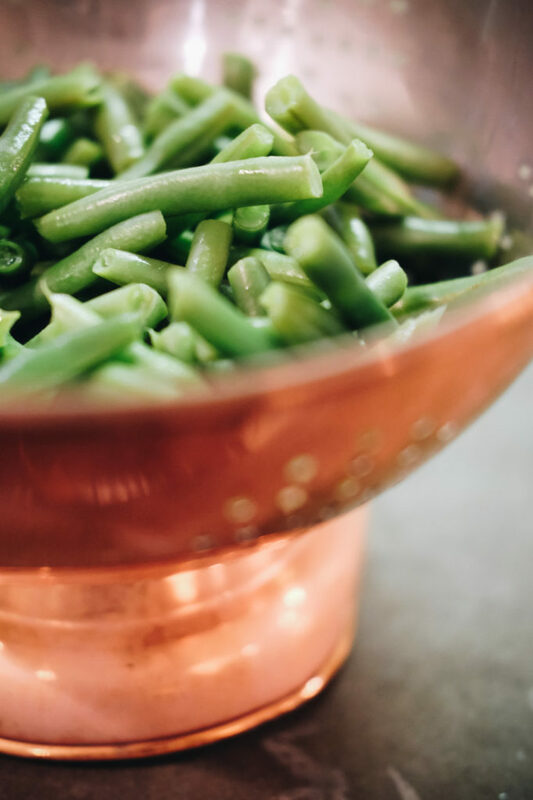 In a medium-size saucepan, cover green beans in salted water. Boil until green beans are just done, (still have a snap to them). In a large skillet over medium heat, melt the butter and saute shallots until translucent. 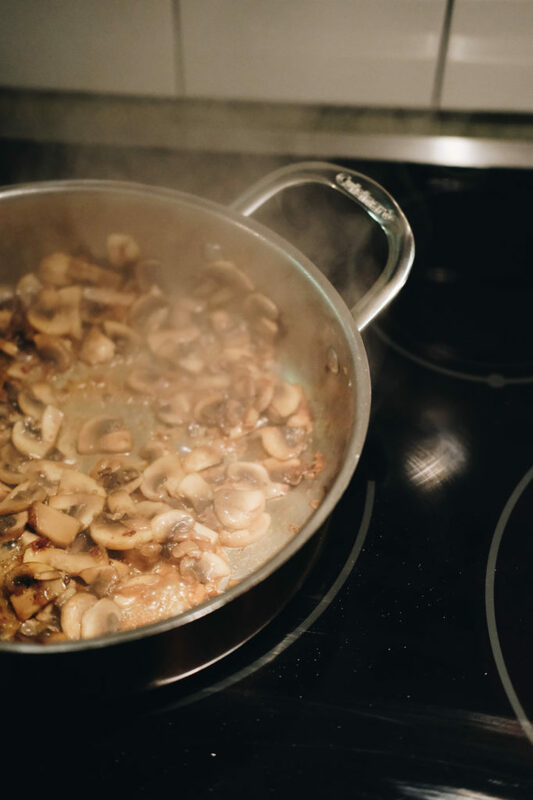 Add mushrooms and saute until mushrooms are browned. Deglaze pan with sherry and let simmer for about 1 minute. Lower heat to medium-low and stir in goat cheese until melted. Add thyme, half of the parmesan cheese, salt and pepper. Stir in green beans until evenly coated. Sprinkle with nuts and the other half of the parmesan cheese. 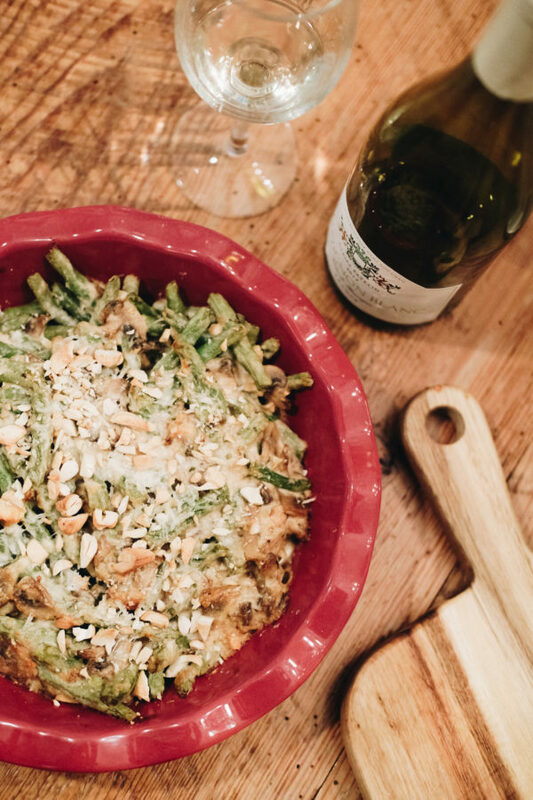 Pour into a small casserole dish and put in the oven at 350 degrees for 25 minutes or until brown and bubbly.